It is very important to schedule carpet cleaning for your home or business in Grabill at least one time every 6-12 months. You need to maintain your car each year and carpet is no different. It requires routine cleaning and yearly deep cleaning to maintain its quality and color and extend its lifetime. You need to be sure you hire the best Grabill carpet cleaner. Hiring the wrong service can lead to irreversible damage to your carpet or introducing various chemicals and toxins into your home. You also need to be positive the company you hire uses processes safe for children and pets if you have little ones in your home. We also recommend reviewing each company’s online reviews and their website for more information on their cleaning services and process. 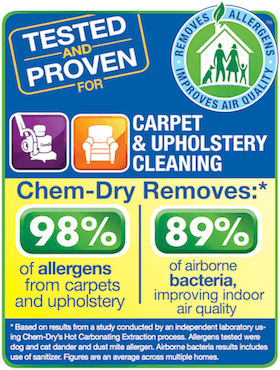 Chem-Dry of Fort Wayne offers more than carpet cleaning Fort Wayne services. We are proud to serve nearby communities including Grabill. Our service area includes all of Allen County, IN. The carpet cleaning methods we use do not require chemicals or soap or toxins. The methods we use require less water too. The end result is drier, cleaner and healthier carpet for your home. Chem-Dry of Fort Wayne carpet cleaning starts with vacuuming the surface of your carpet in your Grabill home or business. Then we spray The Natural®, our proprietary solution, onto the surface. This solution creates a carbonated mixture that lifts dirt and bacteria to the surface of the carpet. Then we use Hot Carbonating Extraction (HCE) equipment to remove the soils and allergens and dispose of them away from your home. This process requires no more than a couple of hours depending on the total amount of square feet we clean. After, your carpet is dry in only a couple of hours (depending on humidity). You will love the fresh scent and clean appearance of your carpet! Our services include upholstery cleaning for the furniture in your home. We clean recliners, love seats, ottomans, car interiors, boat interiors, dining room chairs, benches and more! The same techniques from our carpet cleaning service are applied. We vacuum the furniture, mist The Natural® onto the upholstery and then use Hot Carbonating Extraction to remove the allergens, germs and dirt. You can relax on your furniture again later that same day! You don’t need to wait days or longer to be able to use your chairs and couches again. We offer rug cleaning in Grabill too! This includes rug runners, area rugs, Oriental rugs and heirloom rugs. We provide the perfect level of care and the proper techniques for all rug constructions and materials. You can feel confident in trusting in Chem-Dry of Fort Wayne for cleaning your fine rugs and textiles. We have the training, certification and the experience needed to deliver superior and safe results. Call Chem-Dry of Fort Wayne today at (260) 409-1138 to schedule one or more of our cleaning services in Grabill, IN.